Mount Washington Resort was the creation of industrialist Joseph Stickney, who built The Mount Washington Hotel in 1902. The sparking white and red-roofed Spanish Renaissance-style hotel, with its grand, colonnaded veranda, was the setting for the historic Bretton Woods Monetary Conference in 1944. The resort offers guests a vast array of recreational and leisure activities both indoors and out – from its Prohibition-era speakeasy, The Cave, to its acres of wooded National Forest. 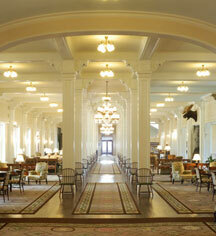 Recent renovations to the Great Hall and Dining Room reflect the Hotel’s history and natural surroundings. 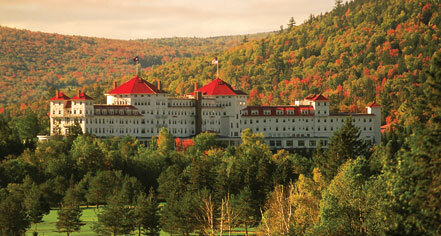 Omni Mount Washington Resort, Bretton Woods, a member of Historic Hotels Worldwide since 2014, dates back to 1902. Mount Washington Resort was the creation of industrialist Joseph Stickney, who built The Mount Washington Hotel in 1902. The sparking white and red-roofed Spanish Renaissance-style hotel, with its grand, colonnaded veranda, was the setting for the historic Bretton Woods Monetary Conference in 1944.